A lot of marketers believe that they don't need to ask customers questions about their individual situation and needs because, by doing so, they would have to admit that they don't have the right data, analytics, persona or content. And yet, the most effective ad platform is Google adwords, which elicits a user response to the question, "What are you looking for today?" So, how important is it to ask questions? The answer: very important. Advertising click-through rates are so low that ad rotators are now commonplace on most websites, including behind the login where the bank knows exactly who the customer is, as shown below. If you know which ad to serve, why would you rotate ads? 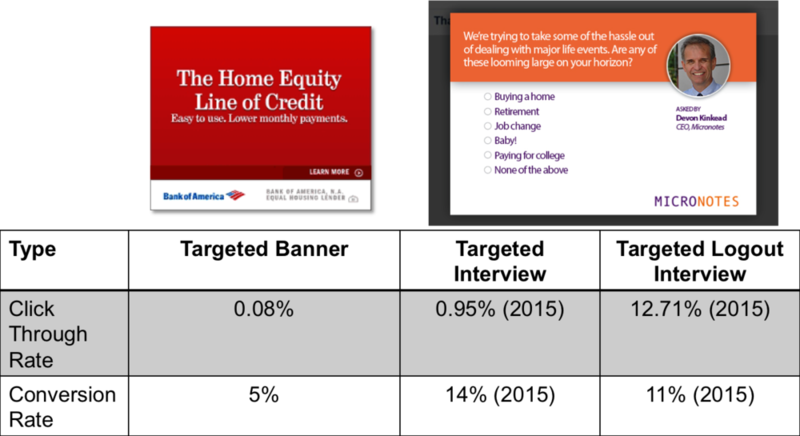 This is an ad rotator on the secure side of a retail online banking account for a retail customer. The logic behind a merchant services offer to a retail customer utterly escapes me, however. The upside of being able to target and listen is huge. Let's assume you show an add to 1,000 people, you're likely to get one click. Replace that ad with an interview and you'll get about 10 clicks—or about 100 clicks at logout (see below). The net result of the ability to listen is either 33X more leads in the online session or 350X more leads utilizing the logout interview. But, don't take our word for it. Install the Micronotes free trial on your own logout landing page and see for yourself. You'll be very glad you did. Learn More About Our Free Trial!